Have you ever wondered how netizen comments affect idols? Do they even see what we're saying? Some celebrities say they don't monitor due to hurtful comments. We certainly know some do, as is the case with Taemin in his newest roll on 'We got married'. Over the last few days I have seen Taemin apologize and refuse to talk about WGM. Wait whut??? apologize??? For taking part on a very popular program? For doing his job? We all know there are haters out there, every celebrity has to deal with them, and normally we don't hear much, it's all part of their job. 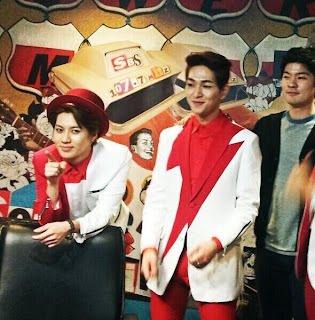 Today Onew, Key, Minho and Taemin appeared on SBS power FM Jang Ki Ha's Amazing radio. Once again when the subject of Taemin's newest program came up, he said to the fans upset over WGM "I'm sorry but i hope you watch it thinking 'oh he can do such a thing"
It seems even the SHINee members felt the need to defend Taemin today because Onew said "think like he is doing a sitcom" to which Taemin agreed "YES!" Seldom does Onew as leader come out but I think its pretty significant he felt the need to speak up and defend his maknae today. I can only imagine whats been going on at the dorm and possibly even at SME. Now everyone knows that Taemin is my ultimate bias and therefore are probably thinking I'm all delulu and butthurt. Well sorry friends and fans, that's not really the case here and I'm not some tweenie fangirl, I'm an adult and I'm concerned about what this might be doing to Taemin himself. There's the very real possibility that all this hate might interfere with how Taemin interacts with Na Eun on the show! Some of the cutest parts of the show are the backhugs and hand holding. Will he be inclined to do so while worrying how much more hate will happen when he does this? How could he NOT be concerned? I was really sad when JKH asked Taemin to leave a message for Na Eun and....silence. He wouldn't or couldn't? say anything. I really thought things were settling down a bit after the first episode of WGM aired but I guess I was wrong. Netezin's just need to leave them alone and just let them do their jobs. We fans love to see every moment we can catch of our idols, except I guess, when we don't like what they are doing. Then certain netizen's feel the need to blast them and take them down.....to the ground if necessary. Let Taemin do his job! Which is to entertain us and make us smile! Don't make him feel bad and apologetic! Personally I was smiling like a nuna fool while watching their sweet interactions. special thanks to jujugal (@juju_home) for her always wonderful realtime translations.